Screw conveyor name “ Auger ” also to delivery solids particals on drilling site . It will contains one set motor with low power requirement , cause the screw can working continuously , the working for transport solids will be continuous as per request and require minimal operator actually . The screw conveyor normally used to delivery drilling cuttings from shale shaker from one point to another point depending on clients request . 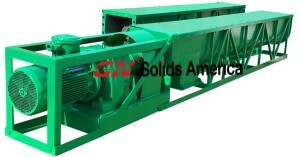 As the screw conveyor is steel material and mainly working to delivery straight away . The solids will be discharge under one end of screw conveyor to another screw conveyor or drilling cuttings storage . There are different length and diameters for screw conveyor depending on different applications . The diameter normally we have is 12 inch , 14 inch and 16 inch , the length of screw conveyor we have normally 24 ft , 36 ft and 48 ft . Any how , the size of screw conveyor can be customized . There are horizontal screw conveyor to delivery solids horizontally and purpose is the delivery solids far away somewhere . Such as the screw conveyor for collecting drilling cuttings from shakers, it maybe 2 or 3 or even more shakers discharge need collection , we will choose an horizontal screw conveyor to collect solids from all shakers . If we use for feeding vertical cuttings dryer , we will have to choose an different layout. The screw conveyor need collect cuttings from one screw conveyor and feed drilling cuttings to dryer on top opening . The second screw conveyor will be goes from a low position to a high position by delivery solids from ground to top . Other than screw conveyor , there are other equipment for solids transport Please contact GN Solids for inquiry or question .